—Paul has real power from God. He does not live in the hype that blinds the crowds. He do not hype himself up like self-righteous leaders, and yet, his grace, his suffering for the Gospel, is his actual power to execute God’s will. These are things that mark a true leader in the church who can witness to Jesus Christ. It seems to me like most sales people will tell you ANYTHING to make a sale. It doesn’t matter if it is true or not. Have you ever been chatted up by a salesperson only to catch them in a complete and undeniable lie, only to have them deny it and then change the subject? Unscrupulous sales people will often make claims that are not true, or are partially true in order to make a sale. I was surfing the web and I found some sites that list the most common lies that salespeople tell. The lies are both hilarious and scary at the same time. Hilarious because the lies are so silly, but scary because many times the lies actually work! I have compiled my favorites into a top ten list. The top ten lies that salespeople will tell you to make a sale. Lie # 10: Last year I increased my customer satisfaction rating 400%! It is most likely that the salesperson is twisting the numbers. Going from a customer satisfaction rating of 1 to 4, on a scale of 1 to 10, is 400% better, but you’re still below average. Lie # 9: That shirt looks so great on you! False flattery to build rapport is a lie. Most of the time, you could be wearing a ripped up old tie-dye t-shirt and hear this line. Lie # 8: My competition is terrible, you should buy from me. Putting down competitors without any real data is straight up manipulation based on feelings. A lie. Lie # 7: I can definitely get you 85% off of list price on that! Promising impossible deals is unethical! Lie # 6: I hope you are well. If you don’t know me at all, do you really care what kind of day I have had? Outside of a general good wish for humans, this is a lie. Lie # 5: I am not selling anything. This lie baffles my mind. I had a door to door bug exterminator use this one on me on Friday. I asked him, “what are you selling?” He replied, “I’m not selling anything, my van will be in your neighborhood next week and I wanted to offer you an opportunity.” To which I replied, but I will have to pay for your service, right? “well yes.” Then you are selling something. Lie #4: We are running out of stock, so you better act now! – This is especially stupid when people are selling things that are high in supply like cars. Salesman will pressure you to buy right now without thinking it through, It’s a lie. Lie #3: “If you sign the contract today, we can start tomorrow” Another lie to pressure you into buying something without actually thinking through the purchase. Lie #2: “We’re the only company that can provide this solution” – It is very rare that there is a market that has not been accessed by at least two companies. Usually this is claim is garbage. And the #1 lie that Salespeople like to tell people: “My product will not only trim your hedges but will also mow your lawn.” Overpromising what a product or service can do is a common lie salespeople will tell you to make a sale. Usually, we can see through the lies salespeople tell us, but sometimes, especially if we WANT to believe what we are saying, or if we want to buy what they are selling, we let ourselves believe their lies. All this talk of sales is to put into perspective what people think of us when we try to “sell” the Gospel message to others. We call it evangelism usually, but just like sales, Evangelism is at its core, persuasion. God has extended grace out there to all people, our job is to help persuade them to accept that grace by accepting Jesus as Lord and Savior! And then we are to keep persuading them to follow Jesus in the way of righteousness. We are called to persuade not with lies, like an unscrupulous salesman, but with truth and sincerity. This can be a tough sell because following Jesus is hard. This was the Apostle Paul’s primary mission as well. Today, we have a section from one of Paul’s letters to the church he planted in Corinth. That congregation had some serious problems. One of which was a bunch of lying salespeople trying to sell the congregation on a false Gospel message about how to follow Jesus. Their message was easy on sin, allowing people not to have to make hard choices to follow Jesus. These fake apostles were preaching against Paul and lying to the congregation. In his defense, Paul writes about how his actions speak louder than the words of his opponents. The same is true for us when we try to persuade people to accept Jesus. One of the commentators I read put it perfectly. Murray Harris said, “The life of the Christian minister is the most eloquent advertisement for the gospel.” I could not put it any better. And that is a message that is backed up by what Paul wrote to Corinth in our scripture passage this morning. Paul’s very life of service and love and endurance and selfless behavior is his proof of his genuine motives to persuade the Corinthians to accept Jesus Christ as their Lord and Savior. And The same is true for you and me. Anyone can speak convincing lies about Jesus, but the strongest witness is not words, but a transformed life. Our challenge, brothers and sisters, is the same as Paul’s challenge. When we live our lives for Jesus Christ, we live our lives not only to get people to accept Jesus as their savior as a one time event. As disciples of Jesus, we are told to persuade others to obey Jesus and live according to the righteousness of God! Usually, people do not take kindly to rebuke from another. Especially if they feel like the person who is rebuking is being too strict. As a witness to Jesus Christ, you will find yourself rebuking other believers in love when they go astray. And what usually happens? You get personally attacked and discredited by those who don’t want to be rebuked! Your credibility will be put in the spotlight and attacked, so that people can sin the way they want to – guilt free. When Paul started to rebuke the Corinthians for things like splitting into factions, impure sexual morals, and selfish boasting, some people began to challenge Paul as a liar. After all, the Greeks in Corinth lived a life with FAR lower ethical and moral standards than Jesus required. In many of their minds, Paul was being too strict, like a wet blanket. Some opponents said people could still do what they want and worship Jesus. These liars tried to discredit Paul! In the moment, it was hard for the Corinthians to know who to trust. They wanted to trust the false teachers because they WANTED to live sinfully because it was fun! And they were used to acting in sinful ways. Jesus was a whole lot stricter than the Greek gods and goddesses whom the Corinthians used to worship. And Paul was trying to help people following Jesus. Ultimately, the way he lived his life for others was the most convincing persuasion Paul had when he was attacked. For Christians, the way that we live our lives is our most persuasive evangelism to believers and non-believers alike. This is out take away. If you have not already encountered push-back or insults when you try to persuade people to live holy lives, you will. At that time, your biggest credibility will be the way in which you have lived your life. For Paul, it was his life of hard work, sleepless nights, hunger, purity, understanding, patience, kindness, love, truth, and consistency. If you choose to live your life consistently for Jesus, your life will be a credit to your word like it was for Paul! We have all experienced or heard stories of people rebuking others, only to get cut down. A common example is a parent asking their child not to move in with their fiancée before they are married. Another common example is telling a friend or relative that if they want to please God they have to go to church more than twice a year! One I run into a lot as a pastor is telling people that they ought to give God at least 10% of their gross earnings through tithes and offerings to the church. Many folks will make up any lie to discredit someone who tells them to give self-sacrificially. However, if you live a life consistent with the righteous life that you preach, then when people lie and discredit you, they won’t have a leg to stand on. Even though it might cause pain in the moment, the truth always comes out in how people live. 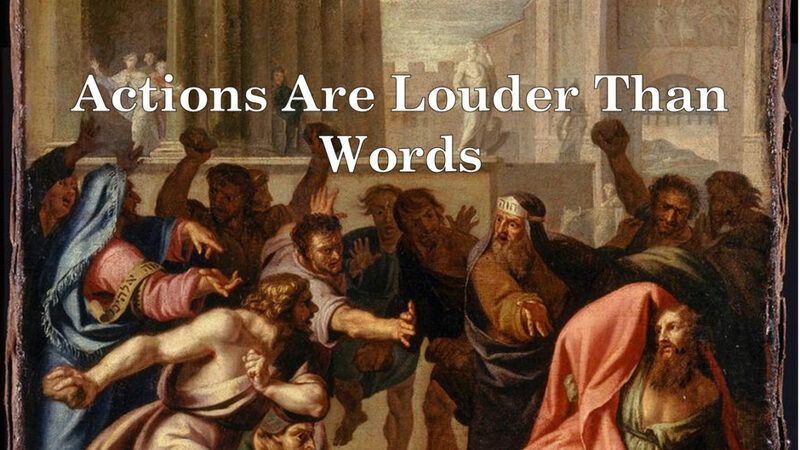 That is why this sermon is titled: Actions are Louder than Words. Words are needed, but how consistently we live our lives for Christ allows us to boldly proclaim the Good news of Jesus, even if it seems like bad news to some people in the moment! And that is just one way that the Holy Spirit heals broken relationships and saves this sinful planet. So I urge you brothers and sisters, protect your witness by trying your hardest to live the way Christ commands. And I know the Holy Spirit will help you have a loud and clear witness through your actions.